San Francisco, Calif. (December 4, 2017)— Trumark Urban has announced the complete sellout of Knox, a mixed-use residential development consisting of 91 condominiums in the heart of San Francisco’s Dogpatch neighborhood. Knox experienced a complete sellout in just under 10 months, making it one of the fastest selling communities in San Francisco since launching sales in March 2017, which were led by West Coast condominium sales and marketing firm Polaris Pacific. Located just steps from the 22nd Street Caltrain station and within a bourgeoning neighborhood brimming with eclectic shops, galleries and eateries, Knox represented the only for-sale residential community in the Dogpatch neighborhood. Located at the corner of 22nd Street and Mississippi Street, Knox is made up of one-, two-, and three-bedroom homes boasting organic modern interiors accentuated by natural elements with an industrial edge. Designed by BDE Architecture, Knox’s architecture and interiors emphasize effortlessly elegant living spaces that are deeply rooted in comfort and composed in organic textures and finishes. The landscaping, designed by Miller Company, features lush plantings in the courtyard and around the building’s exterior, including a butterfly habitat for native butterflies. Additional community amenities include a fitness center, community lounge, green roof and a central courtyard with barbecues, fire pits, and a water feature. Further, there is onsite car and motorcycle parking, personal storage, designated car-share spaces, and bike storage with a bike repair shop. Trumark Urban has also reached more than 90 percent sold at its other prominent San Francisco project, The Pacific, since launching sales in summer 2016; and sold out of its project in The Mission District, Rowan. The Pacific is a collection of 76 residences located in San Francisco’s prestigious Pacific Heights neighborhood and is considered the crown jewel of Trumark Urban’s portfolio, breaking a price record earlier this year at $3,921 per square foot. Rowan is a residential community consisting of 70 condominiums located in The Mission District boasting an expansive communal rooftop deck with panoramic city views. “We are extremely proud of everyone involved in the success of this project from our sales and marketing team to our architects, designers, contractors and beyond,” said Gregg Nelson, Co-founder and Principal of Trumark Companies. 70-residence building began selling slightly more than a year ago. Trumark Urban announced on Monday the sellout of Rowan, a 70-residence, mixed-use residential building in San Francisco’s Mission District. This news comes on the heels of Trumark Urban announcing a rapid sellout at Knox, its project in San Francisco’s Dogpatch neighborhood just last week. Sales for Rowan launched in October 2016, led by West Coast condominium sales and marketing firm Polaris Pacific. SAN FRANCISCO, Dec. 11, 2017 – Trumark Urban announced today the sellout of Rowan, a 70-residence, mixed-use residential building in San Francisco’s flourishing Mission District. This news comes on the heels of Trumark Urban announcing a rapid sellout at Knox, their project in San Francisco’s Dogpatch neighborhood just last week. Sales for Rowan launched in October 2016, led by West Coast condominium sales and marketing firm Polaris Pacific. Trumark Urban’s The Knox in San Francisco’s Dogpatch Trumark Urban has sold out its condo complex in Dogpatch. The Knox, a 91-unit condo complex, hit the market 10 months ago. 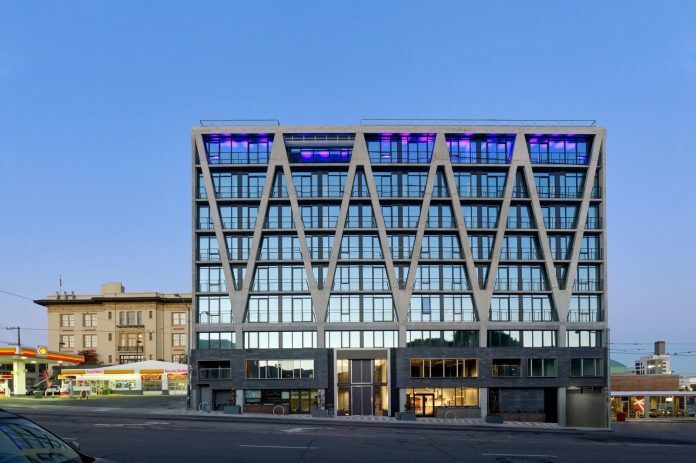 The developer also has sold 90% of its residencies at The Pacific, which launched sales in summer 2016 and has sold out its project in The Mission District, Rowan. The Pacific has 76 units in Pacific Heights. It broke a price record earlier this year at $3,921/SF. Rowan is a 70-unit complex in the Mission District and offers a rooftop deck. The Knox, which is at the corner of 22nd and Mississippi streets, is made up of one-, two- and three-bedroom units. The project was designed by BDE Architecture while landscaping was designed by Miller Co.
Community amenities include a butterfly habitat, a fitness center, a community lounge, a green roof and a central courtyard with barbecues, fire pits, a water feature, on-site car and motorcycle parking, personal storage, designated car-share spaces and bike storage with a bike repair shop. Polaris Pacific was in charge of marketing and sales at The Knox. 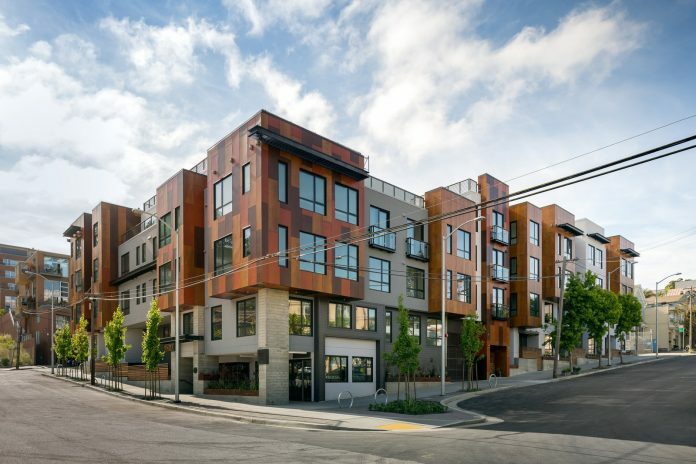 SAN FRANCISCO, CA – Trumark Urban announced the complete sellout of Knox, a mixed-use residential development consisting of 91 condominiums in the heart of San Francisco’s Dogpatch neighborhood. Knox experienced a complete sellout in just under 10 months, making it one of the fastest selling communities in San Francisco since launching sales in March 2017, which were led by West Coast condominium sales and marketing firm Polaris Pacific. Located just steps from the 22nd Street Caltrain station and within a bourgeoning neighborhood brimming with eclectic shops, galleries and eateries, Knox represented the only for-sale residential community in the Dogpatch neighborhood. SAN FRANCISCO, Dec. 4, 2017 – Trumark Urban has announced the complete sellout of Knox, a mixed-use residential development consisting of 91 condominiums in the heart of San Francisco’s Dogpatch neighborhood. Knox experienced a complete sellout in just under 10 months, making it one of the fastest selling communities in San Francisco since launching sales in March 2017, which were led by West Coast condominium sales and marketing firm Polaris Pacific. Located just steps from the 22nd Street Caltrain station and within a bourgeoning neighborhood brimming with eclectic shops, galleries and eateries, Knox represented the only for-sale residential community in the Dogpatch neighborhood. San Francisco, Calif. (December 4, 2017) – Trumark Urban has announced the complete sellout of Knox, a mixed-use residential development consisting of 91 condominiums in the heart of San Francisco’s Dogpatch neighborhood. Knox experienced a complete sellout in just under 10 months, making it one of the fastest selling communities in San Francisco since launching sales in March 2017, which were led by West Coast condominium sales and marketing firm Polaris Pacific. Located just steps from the 22nd Street Caltrain station and within a bourgeoning neighborhood brimming with eclectic shops, galleries and eateries, Knox represented the only for-sale residential community in the Dogpatch neighborhood. Located at the corner of 22nd Street and Mississippi Street, Knox is made up of one-, two-, and three- bedroom homes boasting organic modern interiors accentuated by natural elements with an industrial edge. Designed by BDE Architecture, Knox’s architecture and interiors emphasize effortlessly elegant living spaces that are deeply rooted in comfort and composed in organic textures and finishes. The landscaping, designed by Miller Company, features lush plantings in the courtyard and around the building’s exterior, including a butterfly habitat for native butterflies. Additional community amenities include a fitness center, community lounge, green roof and a central courtyard with barbecues, fire pits, and a water feature. Further, there is onsite car and motorcycle parking, personal storage, designated car-share spaces, and bike storage with a bike repair shop.